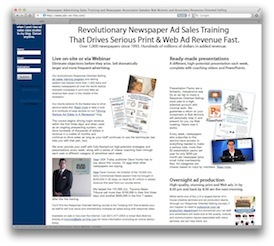 Driving Serious Newspaper Ad Sales: "Every ad contract we present is selling!" "Every ad contract we present is selling!" Last year, our Response Oriented Selling newspaper clients drove some serious ad revenue in the recession. One newspaper has been consistently up 18-20 pages per day and $100,000 per month since early fall and shows no signs of slowing down, which is the idea. This year looks like it will be more of the same for these as well as the newspapers we've been working with in January and February in South Carolina, Minnesota, Montana, and Delaware. For example, last week we wrapped up our one-on-one follow-up sessions at the 20,000 circ. Daily Inter Lake in Kalispell, Montana. After our on-site, we helped 18 ad reps create ad strategies for challenging prospective advertisers and then practice the presentations incorporating our new Response Oriented Selling techniques. Each ad rep left with large ads to present--mainly full or 3/4-page ads--with a recommendation to run once or twice a week. I see that Karen has been keeping you up to speed on our success with your program. I want to add my thanks and kudos as well. We have sold every single one of the specs. I’ve been on all the calls, and I’m extremely proud of my people. After their role plays with you, they continued to really study the infamous page 25 and by the time we were actually in front of the customers they were without exception personable, polished, informative AND following the script to the letter. It really, really works and I’m very excited. We are on our second round of target accounts for next week, and I fully expect that we will continue along this great path. Thanks again for all you did for us and your ongoing support. Once the ad reps learn the new techniques (and I walk them through them one-on-one), it's just a matter of the managers repeating the process each week and closing one account after the other, which is what Cindy is doing now. I'll be sharing many of these "before and after" case studies in upcoming posts. Stay tuned!